Subtitle: why blogging comes naturally to me. My profiles on Facebook and Mile High Mamas say “Blogging in my head since 1980.” Which isn’t the whole truth. Yes, I’ve been blogging in my head, but I’ve also been journaling on paper. On my mngm-teenth birthday in late 1979, my dear Aunt D gave me a 1980 desk calendar. I declared it a journal, and have documented every day of my life ever since. If you’re counting, this is my 30th year or recording each day of my life. Most nights, I just convey the day’s significant events (if I’ve met you or interacted with you substantially, you’re probably in there), but there is also room in the back of each booklet for free-form thoughts, struggles and wonderings. Each year, Aunt D sends me a new calendar for my birthday. 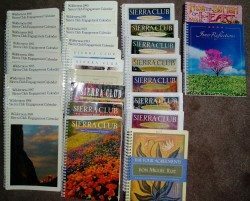 For years, it was a Sierra Club calendar. But lately, she’s gone all adventurous on me and branched out to new styles. Each one she chooses is perfect for the time. I am nothing if not easy to shop for. And now, something that hasn’t seen the light of day for 29 years. The very first page of my journal. I’d like to believe that no one will click to enlarge (how exciting can an mngm-teen-year old’s life be? ), but I’m prepared that some of you will. Try to overlook the obvious boy-craziness. On the first DAY I mention 3 boys, with varying degrees of love and hate (I can’t even remember who Ricky and Randy were, but I’ve mentioned Doug before). I can’t help but love the girl who wrote this, who ached to be found worthy. I started this journal because I was certain that my mom had never been a teenager. She had no idea WHAT I was going through because she was born ancient — 30 at least. I was going to prove to my own hypothetical daughter, someday, that I could empathize with her. Ha! There’s no way my real daughter will ever see these. Not until she’s a mom, anyway. Wait, I should rephrase that. Not until she’s double the age I was when I started writing. You can guess what I would grab if my house caught on fire (assuming all the people were safe). See what the other angst-ridden kids are showing and telling over at Mel‘s. Oh Lori – I totally heart you! You and all your boy craziness because it means I was normal too when I was mmmmmgnhhteen.I didn’t have an Aunt D to give me Sierra Club calendars, but I read Anatasia Krupnik books and so kept notebooks. I wish I could put my hands on one or two now . . .And I would seriously, seriously DIE if my daughter ever got her hands on one of my old journals and read about how silly and boy crazy <>I<> was at mgnnnhteen.In fact, I would probably seriously die if I read them myself . . .Great show and tell! Those are a bunch of calendars. I love it.I have several things from some of my major crushes in my 20’s. I figure someday I may show them to my daughter. Or not. How cool! I often wish I had kept a journal/diary. That is too cool! I would start out with journals, but the page always seemed so big and blank. 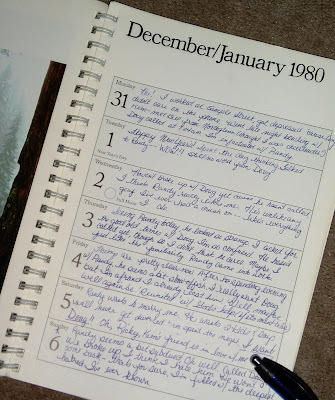 Maybe if I had journaled in a day planner, the task would not have seemed so daunting.It is so awesome that your are able to look back over the years and peek in on a little snapshot of your life.Maybe I’ll start now . . . This is TOO cool. To have a daily snapshot into your life at any time over the years. Awesome. That is really awesome. I used to keep a journal but once I started writing I would not stop and then because it would take so long I wouldn’t do it again and then when I did I had a lot to say again so it was a crazy cycle so I stopped. Writing in a calendar is perfect! That is so awesome! I don’t think I have kept something going like that long. My mom used to keep journals. She passed away 8 yrs ago and my Dad is saving them for me to read but I’m afraid to. I think some day I will. I often wondered about keeping a journal and tried a few times but don’t stick with it. I do keep a gratitude journal.Do you think it helps you to write things down? I keep thinking I should but not sure how it helps.. love to hear your thoughts on this.Keep writing! This is perhaps one of the greatest show and tells of all times. You are so incredibly lucky that you had the forethought to write everything down and to be committed to the project. You should start it soon with your kids. Maybe start it on their 10th birthday with your help each day until they can write it on their own? I love that you have kept writing in it every day. I was never that disciplined until I started blogging, and even that isn’t always consistent. I love going back and reading earlier entries in my blog.Looking back to see how you viewed the world and your life years back must be quite the trip down memory lane. It always is for me. “I’m filled with the deepest hatred I’ve ever known.”Priceless portrait of adolescence. I kept a journal of sorts as a teenager, but became too paranoid my parents would find it, so I burned the pages and flushed the ashes. Now, I wish I had kept it, if only for a laugh now and then. I have years worth of journals as well. I think I would die of embarrassment if a nanogram of them were published for the world to see.Yours cracks me up. It’s hard to believe ever being that boy-crazy. There isn’t a word for how impressed I am at your diligence! I journaled through high school. But even back then, I was writing novels, making my life infinitely more melodramatic than it actually was. One day while in college I decided to just burn them. BIGGEST. MISTAKE. EVER. That is something really neat to look back on. I love journals. That is so awesome! My grandmother also wrote in a datebook for several years. I would give her new ones every year — Norman Rockwell. I must ask my mother if she has them. As for me — lurking somewhere in the depths of my closet at my parents’ house is a cardboard box containing a pile of journals that I started when I was 7 & kept on & off through the years until I was in university. I don’t think I could ever burn them, but I’m still not ready to look at them again (much less ever share them with the rest of the world…!). Oh how great is THAT?! I didn’t click on the picture to enlarge it, btw. I doubt very much, I’d let my daughter read any of my journals from hen I was a teenage…EEK! Thank you for sharing! Wow! That’s amazing! For over 20 years to document every single day.. I take my hat off in front of you! see-your fate to become such a talented writer started out early! you are so cool lori! I love this! I so wish I’d kept a journal over the years, what a treasure trove. I clicked to enlarge–and loved reading about Randy and Doug. How smart were you to keep it to a small snippet each day? Much easier to keep up with than a whole page per day, and now you have these priceless snapshots of who you were so many years ago. Wow. That is just great! I kept a journal throughout high school and college, but I stopped once I started working. This makes me wish I had kept going. The calendar is a great idea. I love going back and reading my old journals – makes me laugh. That is amazing that you kept your journals. I was a photo-journalist of my misspent youth and I’m in deep weeds if the boys find those photos before they are much older. Wow Oh Wow! It was wonderful to go through that diary page and read about Randy and Doug and how the entire family planning was laid out…ha ha ha!I am impressed that you were so scruplous, and still are!I used to keep a dairy off and on! But every few years, I would be embarrased at what I had written previously or would suspect family elders to be reading through and so I would destroy them. I wish, I had retained some content from them. I lost quite a few poems I wrote from while I was growing up!